So my wife and I are looking at building a house... hopefully sometime this year. We found a floor plan from a local builder that we are leaning towards. 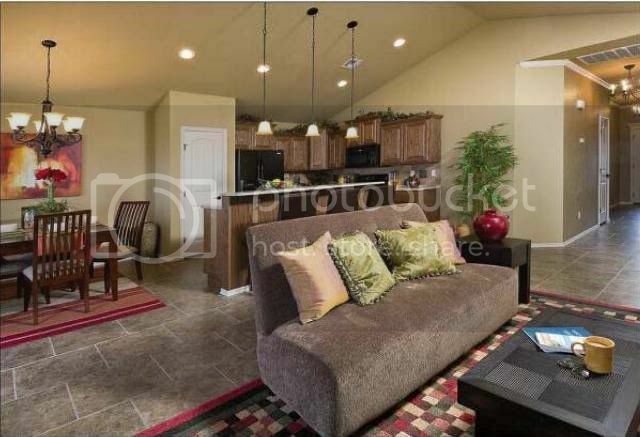 It is an open floor plan and the kitchen/living room are basically connected. 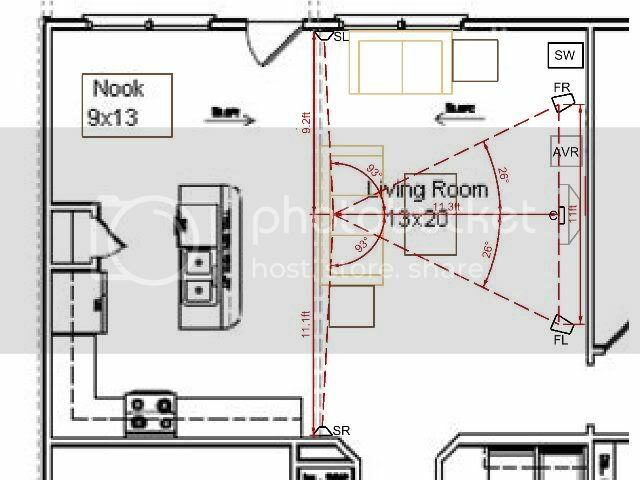 We are not buying a house large enough for a separate theater room so the living room will be where all of my current axiom gear goes. I could take this opportunity to have sub cable ran to a couple of locations. I am thinking that if I went with a 5.2 setup I could place the 2 subs directly under the surround speakers. Would 1 sub on each side (but slightly behind) the listening area be ok? Is a special sub cable required for in wall installations? As far as electrical wiring: Should I have all of the outlets on the wall with the AV equipment ran to the same 20amp fuse on their own circuit? If I have sub cable ran to the SL and SR locations should I have outlets here on the same 20 Amp circuit? Any general thoughts about my planned layout are appreciated. By an open floor plan, does this mean there is absolute no wall behind the couch? I would not put the subs on the same circuit as the AV equipment. They can be on their own circuit, 15 amp is probably fine but overkill is never bad if you want to go 20. Same with the AV equipment. I run my projector dedicated on a 15, the equipment on another 15 (5 devices) and the sub (and later on a second) on another 15... No problems at all. You won't really know where to put the subs until you can get in there and do a crawl. Chances are good though you'll want one up front, and one in back. Two in back may work if you play with the phasing a bit. There is no wall behind the couch. The dashed line on the drawing shows the middle (peak) of the vaulted ceilings. Here is a picture of the kitchen area looking from the living room. This particular picture shows all tile, but I would have carpet all the way back to the kitchen area and extending toward the front door. Also, In my proposed setup the couch is further back and shifted over from the picture here. Not bad. I like the open look. I think this could also help to enhance the sound overall. That is, as long as there weren't too many reflective surfaces. They have a model home built of this floorplan in the neighborhood we are interested in (not the one in the picture above). Multiple sub locations is easy. I just did it in my remodel. Just have RG6 pulled to different locations. Then use a coax/RCA adapter and you should be fine. Any special concerns with the cable (extra shielding/ect.) so you don't pick up interference from electrical wiring or something in the wall?